The 2019 NBA All-Star game will take place on Sunday, February 17 at the Spectrum Center in Charlotte, N.C. In preparation for the festivities, we break down the athlete-driven data from the league’s Top 50 most powerful players on social throughout the first half of the regular season. 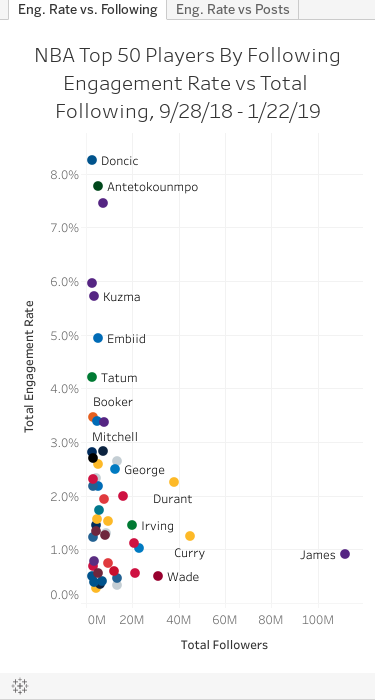 As the stars gather in Charlotte to showcase their skills, the data in this athlete-driven report offers a look at how the league’s 50 most-followed players perform individually on social, measuring their audience, activity, engagement, and growth. With over 111 million followers across Twitter, Facebook, and Instagram, LeBron boasts an audience larger than any collective NBA team. Following James is Steph Curry, who held onto second place ahead of fellow-Warrior, Kevin Durant. Steph will be gunning for his second trophy in the three-point contest on February 16, taking on his younger brother, Seth Curry, as well as sharpshooters Damian Lillard, Dirk Nowitzki, and Buddy Hield. The remaining stars listed below have embraced their unique platform to build their brands on and off the hardwood. Our analysis breaks down the top 50 most-followed athletes in the NBA. The ranking includes data for each athlete from Twitter, Facebook, and Instagram from September 28, 2018, to January 29, 2019.